Photos at TOMO - extended through April 2007! 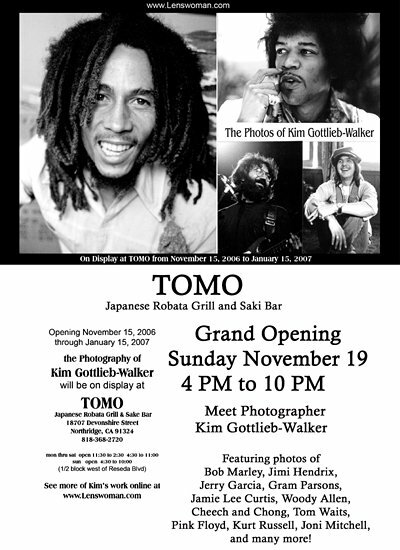 Over 70 of Kim's photographs are on display at TOMO, a new Japanese Robata Grill and Saki Bar which had its grand opening Sunday November 19, 2006 at 18707 Devonshire Street just west of Reseda Blvd. in the Devonshire/Reseda Shopping Plaza in Northridge, California. The photographs will be on display until January 15, 2007. 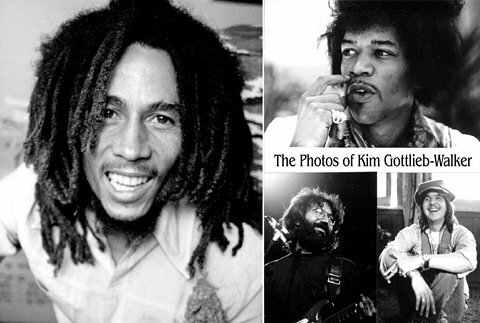 Kim has five photos on display at “The Shooting Gallery,” located at 7403 Sunset Blvd., Hollywood, California 90046, including a beautiful silver gelatin print of Jimi Hendrix. More of Kim’s photos will added in mid-November 2006 through the holidays. Several of Kim’s photos of Gram jamming with Emmylou Harris appear on the new 3 CD release “Gram Parsons — The Complete Reprise Sessions” by Rhino Records, and several of her photos of Gram and Emmylou and the band appear in the DVD “Gram Parsons Fallen Angel” by Gandulf Hennig, also released by Rhino. You can see a few Gram Parson's photos by scrolling down in the Rock ‘n Roll gallery. Two exhibits display Kim’s photos: Behind the Scenes with John Carpenter and Photos of Science Fiction and Fantasy Creators, including snap shots from previous World Cons. Kim will be present to meet fans and answer questions. Last year’s display at Cafe Latte was a very successful event and led to the Petersen's PHOTOGRAPHIC Magazine article and several photos being requested for books and television shows about Gram Parsons. You can use the guestbook form to ask Kim to remind you about upcoming gallery shows by email! Kim's Online Guestbook (linked from the bottom of every page in her site) has been updated will all of your wonderful comments. Read through pages of comments that others have been saying about this site, and then leave one of your own. Welcome to all the visitors coming from HalloweenMovies.com! Many of you have sent in very supportive comments — it's greatly appreciated. 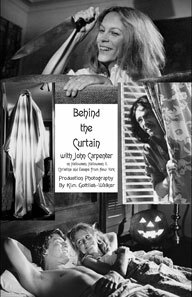 For those of you not in the know, in August, 2005, Kim was interviewed about working with John Carpenter at HalloweenMovies.com. You can read the full interview online. 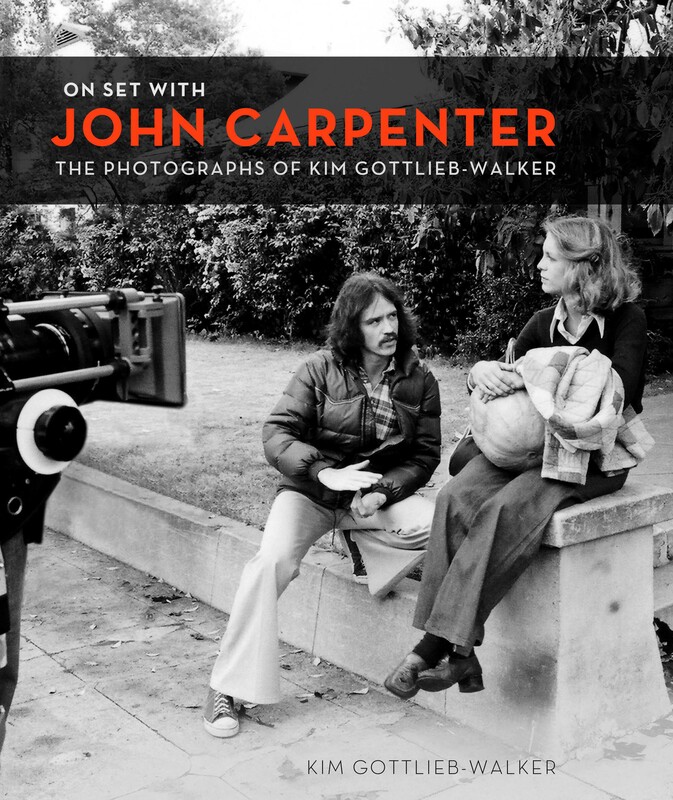 Look for the June issue of Petersen’s PHOTOgraphic Magazine for their career article on Kim. The text of the article is available on this site along with the rest of Kim’s bio, and is also available in the magazine-layout format as a PDF download [357Kb]. From Dec 1, 2004 to Jan. 31, 2005, some of Kim’s work from the 1960’s and 70’s was on display at Café Latte in Los Angeles. The show was so well received, it lead to the creation of this site, a career profile in Petersen’s PHOTO Magazine and the impetus to begin work on several books. 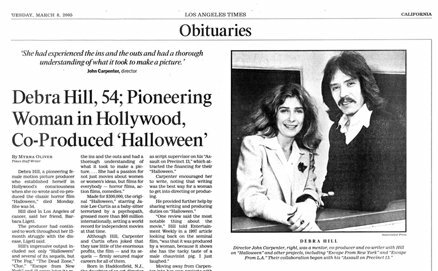 Debra Hill, the producer who first hired Kim to shoot John Carpenter’s “Halloween” and who fought to get her into the Cinematographers Guild, passed away in March, 2005. She was a mentor and a friend and Kim will always be grateful for having known her. 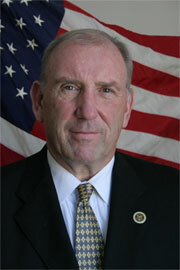 This is the photo Kim took which ran in the L.A. Times obituary section on March 8, 2005. Producer/Director David Kramer has been working on a documentary on Jimi Hendrix for 13+ years. He is incorporating videographics, animation, and special effects with original Hendrix music, never before seen footage and photos (including several of Kim’s) along with nearly 300 videotaped interviews, this promises to be the most complete definitive documentary ever done on Jimi Hendrix. Monica Haim has written, directed and produced a film entitled "Awake Zion" which features one of Kim's shots of Bob Marley. "Awake Zion" is a documentary that explores the connections between reggae culture and Judaism. Through the themes of music, roots and culture, it aims to expose the senselessness of hate or intolerance by highlighting kinship as opposed to difference. Awake Zion screened as a special sneak preview at the DC Independent Film Festival on Saturday, March 12, 2005 @ 4:45pm In April 2004 Awake Zion received the Honorable Mention for Documentary Short at the Black Point Film Festival in Lake Geneva, WI. For information on upcoming screenings, subscribe to the Awake Zion mailing list at www.awakezion.net. The documentary "Fallen Angel: Gram Parsons" produced by Gandulf Hennig, screened at the Arclight Cinema on August 12, 2004 at 7:30pm, opening last year's Don't Knock The Rock festival. It featured several of Kim's photos of Gram. Kim's photos of Gram appear in a number of books including Hickory Wind: The Life and Times of Gram Parsons by Ben Fong Torres and in an interview article with Emmylou Harris in the London Times in March 2004.